December 6, 2017. Reported [here]. Rough translation from Spanish. Chetumal, Quintana. Roo Mexico. 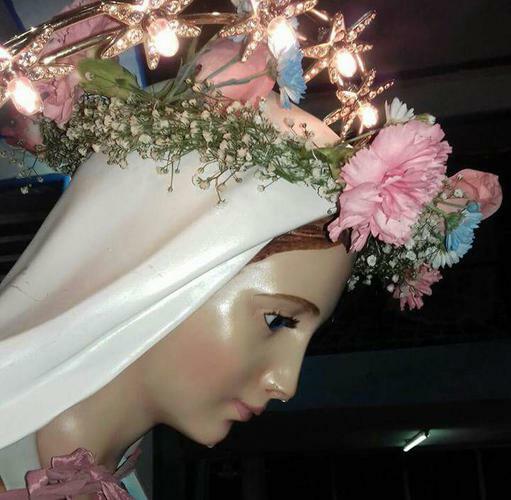 In an unprecedented event for the parishioners of the parish of Our Lady of Guadalupe in Chetumal, and the parish priest of the Church, they witnessed the tears that the Virgin of Peace allegedly shed. The Father, David Martin Leal, in charge of the Guadalupana Church, confirmed that he dried the tears of the image with a handkerchief. According to the data collected, on Saturday night, (approximately 20:00) after having made a tour of various streets of the city as part of the pilggrimages that begain on December 1, 2017, the Virgin of Peace, he arrived at the Church. Once placed in frount of the altar, those who accompanied her on the pilgrimage, about 80 people, witnessed the tears that flowed from her eyes. At the mass, the pastor told those present what had happened, describing it as a transcendental event but of which he does not know why it happened. He said that it was something that had not been given and although it could be a signal, he does not know the reasons. Guadalupe Perez de Lopez, who was present, indicated that it is the first time that she had witnessed something that she called un precedented and that she considered herself privileged of that sign that the Virgin of Peace gave, since she had been going through variuos problems and before being a part of it, of the pilgrimage asked for a sign or sign od faith to the Virgin. All of us who were present were amazed, we went to see her and we witnessed that she shed tears, for Catholics it was a beautiful sign that very few have the privilege of being able to witness. It was in the fourth procession that has been given since December 1, that activities began on the occasion of the festivities of the Virgin of Guadalupe that is commemorated since the night of December 11. According to the calendar, from December1 to 11 of the same month, processions or pilgrimages to the Shrine of the Virgin Mary are expected parishes, schools, workers of different companies. According to the program, on December 11 at 11 o'clock in the evening the Misa de Gallo will take place and at the end of the morning. On December 12 from 6:00 in the morning, the mananitas will be repeated and six masses will be held, and in five of them will be blessings, for children, sick people and the elderly. Finally, that same day at 7:00 last night, the activities closed with the pilgrimage.